A simple fundraising idea that just works! 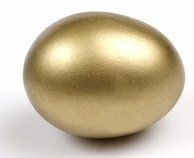 The Golden Egg and its many variations is really easy to do. Takes up no room. Is perfect for indoors or outside and is very popular particularly with children. Every village fete should have a variation of The Golden Egg. All you need is a tray of sand and about 30 empty egg shells. Place the egg shells upside down so they look whole in the sand. Under the majority place a booby prize such as a sweet. Under one place a cash prize - either a large denomination coin or a note in an old ring box or similar. You can do all sorts of variations on this basic fundraising game. 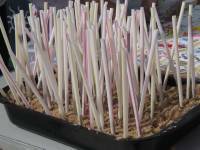 Lucky Straws - Does your straw contain a winning prize ticket or a dud? Hairy Hedgehog! - Pluck out the Prickle (cocktail stick) you choose. A coloured end wins a prize. Secret Treasure! - Old 35mm film canisters (ask in a camera shop) make great little containers for your secret treasure. Will it be coins or a consolation boiled sweet? Crazy Carrots! - Will the carrot you pull out of the sand be just the top cut off 3cms down or the real thing. Whole carrots win a prize. Lucky Corks! -In this one corks are placed in a holes cut in a board. Contestants pay to try to find lucky corks with painted ends. Different colours for different prizes. You could also simply place the corks, painted ends down, in a tray of sand. Tip - ask for corks at local restaurants and wine bars. Lucky Eggs! 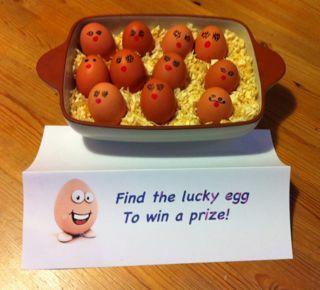 - One of a tray of eggs has its base marked with a golden circle. Anyone who chooses it wins a prize. This makes a great Easter Fundraiser but can be used in all sorts of ways. These eggs had Red Noses for Comic Relief in the UK. Lolly Stick Lunacy! - Will the lolly stick you choose have a painted end? Different colours win different prizes. 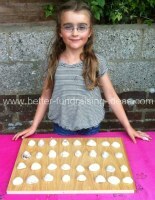 Another simple fundraising idea that goes down well with kids is a variation on this done with real lollipops (the sweet variety not ice lollies!). Place the lollies in a sand tray and sell them as lollies to eat but with the added attraction of a prize if you choose one with a coloured stick. We put out a call at church for old mugs and were inundated. Everyone it seemed had at least one old mug that didn't match their current favourites etc. 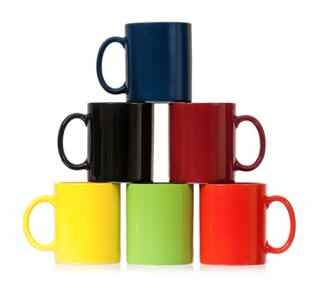 What was great was that the mugs are nearly all different. We use about 50 and put them out on a table at fundraising events. Under one is a £2.00 coin though you could use any other star prize as the treasure (use a voucher or ticket if it is too big to fit under the mug). We put a sweet under all the others so we can say "prize every time". We charge just 20p a guess to pick up a mug and find the treasure. If the treasure is found we have a cardboard screen we put up while we hide it again. Over the last couple of years we have collected some more interesting mugs (at car boot sales and junk shops mostly) ones with slogans on etc. The ones with football teams on are particularly popular with some people. Its not the biggest earner at our fairs but its a nice simple fundraising idea and most people have a go. We have used this at church events and at my daughter's school fair. At the end the mugs are simply packed into a cardboard box and up into the attic until next time they are needed. Yet another variation - some of the tickets have a picture of a ladybird on them. Lucky Shells! 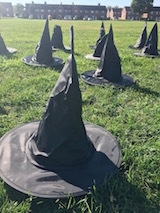 - You couldn't get a more simple fundraising idea than this one. Perfect as a kids fundraiser. 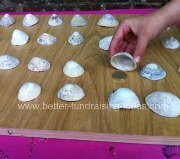 Hide a coin under one of the shells (these are limpet shells from the beach). Contestants pay to find the treasure. You could always put a jelly bean under all the others so that the searcher has a little reward each time. 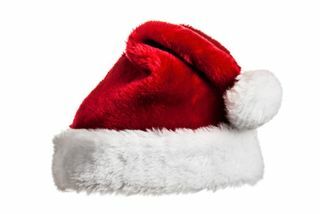 And at Christmas - Twelve Santa hats are placed on the table. A consolation Christmas sweet under eleven of them. A better prize under one of them. Contestants pay to lift a hat and win whatever is underneath. If you come up with a good one let us know and we will put it on the site.